Reading an article in a most impressive in-house magazine produced by a private music school in Singapore (My Musical Chamber – www.my-musical-chamber.com.sg) about the excellent Singapore Symphony Chorus, I was struck by the comment from one of the choir members that "talented young people get scared off by this crazy impression that we're all grey-haired has-beens". What was more disturbing was the comment that "the oldest singer in the SSC is in his mid-fifties". I'm undoubtedly into my mid-50s – in fact some would describe me as being on the wrong side of the mid-50s – and I had seriously considered auditioning for the choir. I love choral singing and haven't been able to do any seriously since I left the Bangor University Choral Society in the 1980s. With no choirs worth talking about in Malaysia, part of the joy in moving to Singapore was the very active choral scene here. I had fully intended joining one, but now learn that I'm too old. What happened to that lovely attitude we had in England where choral singing was one of the things people looked forward to after their retirement, and where choral societies recognised that mature voices were both reliable and solid? Of course, the voice, like the body, deteriorates with age, and for a choir to be as good as the Singapore Symphony Chorus it needs not only a brilliant choral director (as it has in Lim Yau) but voices at the peak of their quality. Sadly, as you grow older, vibrato, insecurity of pitch, an inability to sing in tune (a problem associated with deterioration in hearing) and a fondness for idle chatter with your neighbour, all conspire to make you unwelcome in choirs with an ambition to sound good. But in this mad rush to expunge everyone over 40 from the ranks of choirs, people forget that choirs can also sound too young. Immature voices lack depth, singers lack artistic experience and musical judgement, and the desire to shine can lead to a disrespect for the ideals of ensemble to which any choir must aspire. In an age when "Young is Good" seems to be the mantra which governs every aspect of daily life, it's too easy to think that young is always better than old; and in choral singing it very much is not. I have yet to hear a choir of children or under-twenties sing with any real depth, colour or musical insight. Enthusiasm, yes, real emotion, no. The trouble is, since young voices do not have the life experience to indulge in the emotional depth and artistic substance of the music they sing, their interest is kept alive by turning choral singing into some kind of competitive sport. God forbid, there is even some ghastly and unsavoury thing called the "Choral Olympics"; I suppose these choral Olympians have already started to destroy their bodies with strict dietary and exercise regimes, and some are possibly even taking performance enhancing drugs. That the social and life-enriching activity of choral singing should come to this prompts me to hold my chubby hands up in horror. I am well aware that school Principals in south east Asia and the US – rarely people with any awareness of life beyond what they can quantify on a bit of paper – feel that the only way they can assess the quality of their school's choir is to force them into competitions and assume the results are in some strange way indicative of quality (which they manifestly are not), but they probably also believe that the only real benefits to accrue from athletics is a gold medal and any student who doesn't win one is merely wasting their time. So - and for God's sake don't let the children read this - we can dismiss the misguided views of school principals. There are unquestionable benefits in young people singing in a choir; teamwork, enhanced listening, reading and linguistic skills, emotional enrichment, increased historical and artistic perceptiveness, and a great many more. But let's not confuse something which benefits children's developing minds with something which is a good musical product. 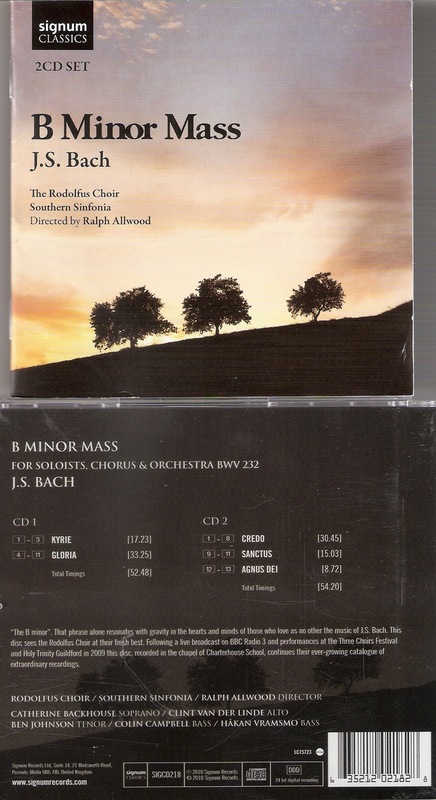 I've just been sent a disc for review of a very young choir – the UK-based Rodolofus Choir – performing Bach's B Minor Mass. It is very good singing indeed from a technical point of view, and most choirs would envy their precision and clarity; they'd walk through any competition with their exceptional vocal stamina. But, while my highly-respected colleague George Pratt waxes lyrical on it in the current BBC Music Magazine (a magazine I usually dismiss out of hand purely because they've never invited me to contribute) I fear his critical faculties have been clouded by their youthfulness. My impression is of a colourless, soulless and light-weight presentation which fails to appreciate the work's position as one of the great pillars of western art music. Simply, they lack the weight and substance which only comes with vocal and mental maturity. I'm not for the old-fashioned, heavyweight "this-is-sublime-music-and-we-are-humbled-by-its-magnificence" approach prevalent in the 1960s and typified by the matchless Klemperer recording on EMI, but I do like to hear Bach performed with not just an understanding of its structure but a profound appreciation of its spiritual depth. The B Minor Mass is not the preserve of the old, but don't be fooled into thinking that just because the singers are young and can rattle off the music's extreme technical demands with astonishing ease, it is in any way an exceptional performance. Singing in a choir is a wonderful experience, and I urge everyone to indulge. But I urge all choral directors of adult choirs to give up this manic pursuit of "young, fresh" voices. Most choral music was never written with that kind of sound in mind, and it not only prevents choral performances from having real musical strength, but turns them into nothing more elevated than simple choral athletics; a sport where, once you are in your 20s, you are already way over the hill.